Is Hair Removal an Issue? Reflections Laser & Wellness Center offers a variety of hair removal treatments to accommodate each of our patient’s needs. If you are not happy with shaving, tweezing, or waxing to remove unwanted hair then we have options worths considering. Our SkinCare Specialist looks forward to answering any questions you might have to help you solve your hair removal issue. Please give our office a call. 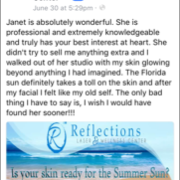 Reflections Laser & Wellness Center can be reached at 561-221-1462. At Reflections Laser & Wellness, we use state-of-the-art Candela / Cynosure Lasers to bring you superior results. The success of hair reduction depends on many factors, such as genetics, health, and lifestyle. Electrolysis is the only approved method by the FDA for permanent removal of unwanted hair. At Reflections Laser & Wellness Center we provide quality treatments to people of all different skin types. REFLECTIONS LASER & WELLNESS CENTER HAS BEEN IN THE BUSINESS OF PERMANENT HAIR REDUCTION FOR 15 YEARS. JANET ROBBINS IS A LEADER IN THE INDUSTRY AND HAS PIONEERED AN APPRENTICE PROGRAM FOR NEWLY GRADUATED LASER THERAPISTS IN SOUTH FLORIDA.